Blue is a popular colour when it comes to prom dresses, and with good reason! There are so many gorgeous shades of blue, you’re bound to find the perfect blue prom dress to suit your skin tone. Whether you want a luxe navy prom dress or a summery sky-blue toned one, there’s something for everyone. Read on to discover our edit of the best blue prom dresses to suit all styles, or check out our edit of stunning red prom dresses if you’re still making your mind up on which colour to pick. This gorgeous sky-blue prom dress from Simply Be is so stunning. The shape is perfect for curvier girls – 1950s style dresses are just made for hourglass figures. The full, skater skirt will skim over the hips and draw in your waist, whilst the on-trend off-the-shoulder neckline will add balance to your figure. This pretty shade will work well on all skin tones too, making this summery gown a real winner as far as we’re concerned. If you need some guidance when it comes to your body shape, don’t miss our guide on how to choose your prom dress. If you want to feel like a real life princess, why not be inspired by Kate Middleton and go for one of her favourite designers? Jenny Packham has created a beautiful range of eveningwear for Debenhams so you can channel the Duchess’s style even without a royal budget. This gorgeous navy blue dress is totally royal-worthy and that glittering waist detail will ensure all eyes are on you. You’ll be re-wearing this beauty at glamorous occasions for years to come! Lace is a great choice of prom dress fabric as it will never go out of style. This high-necked lace prom dress from Tk Maxx is perfect if you have a limited budget but still want maximum impact. The high neckline demands an elegant up do so you can show it off fully – browse our edit of the best prom up dos to pick the right one to suit this glam dress. Who doesn’t love Michael Kors? If you’re as obsessed with the designer as we are, it makes sense to pick a prom dress designed by him, like this cool creation available at House of Fraser. It perfectly channels his laidback American style. Style it with an artfully messy up do, a chic spray tan and some striking silver prom shoes to really stand out against the dark blue hue of this dress. Go seriously glam in this ISSA dress from Debenhams. The Sophia gown is the perfect choice for any girl who wants to make a serious style statement at her prom – the bold cobalt hue is seriously eye catching and those statement sleeves are to die for. This is such an attention grabbing dress it’s best to keep your accessories and makeup simple to allow the dress to do all the talking. We’ve rounded up our favourite prom makeup tutorials so you can pick the perfect beauty look for you. Get watching! Crochet is a trend that just keeps on giving, and we can’t get enough of it especially in this chic navy crochet dress from Little Mistress. We love the textured hem and the fit and flare shape. The midi-length of this dress would make it an ideal pick for taller girls who want a fashion-forward prom dress they can wear again after the big event. How gorgeous is this sequin and satin prom dress from TK Maxx? We love the deep blue hue and the contrasting fabrics on the bodice and skirt. The shape of the dress is super flattering as it creates a dramatic silhouette, and the sparkly bodice will ensure all eyes are on you. The luxe satin skirt looks super expensive as well – no one will guess this is a gem from TK Maxx. Pair it with super high heels and a colourful lipstick for a really fun fashion look. Want to channel old-school Hollywood glamour at your prom? This fabulous, beaded gown from Pretty Eccentric will definitely do that – it has echoes of the charm of the 1920s and the shape of the beading will help to define your figure. It’s floor length making it a great pick for taller girls or those that want to appear taller – just make sure you’ve practised walking in super high heels first! Make sure you read our guide to prom hairstyles for short hair to learn how to do glam 1920s style finger waves to complement the dress. Check out our round up of the best prom makeup tutorials to be inspired. 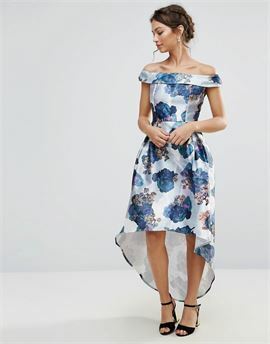 If you’re planning to hit the dancefloor at your prom, you need a dress that was made for dancing in, like this fab ruffled dress from Simply Be. The off-the-shoulder neckline is stylish and we love that there are still sleeves as not everyone wants their arms out. The ruffled skirt will move beautifully as you dance and the asymmetrical cut will ensure all eyes are on you. Still not found the perfect prom dress for you? Don’t worry – we’ve also got an inspiring round up of black prom dresses to tempt you with.